Patrícia Jerónimo is a law professor at the Law School of the University of Minho, in Braga, Portugal. She defended her PhD thesis at the EUI in 2008, with a thesis on citizenship and migration in Portugal against the background provided by Portugal’s competing European and Lusophone international commitments (Identidade, Cidadania, Alteridade: Portugal ainda entre a Europa e o Atlântico, available from CADMUS). Besides citizenship and migration, her main research interests are legal pluralism and minority rights, in particular the rights of religious minorities. 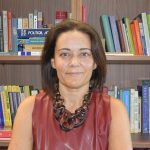 She has also an extensive teaching and research experience in the field of Comparative Law, with several publications involving the legal systems of Portuguese speaking countries, such as Angola and Timor-Leste.